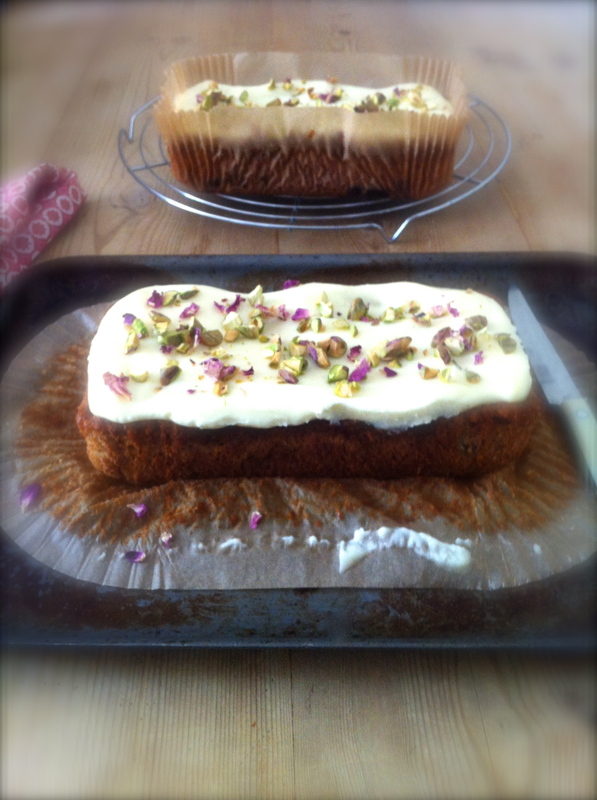 This entry was posted in A Selma's Table Original, Baking, Recipe and tagged Adagio Tea, banana, cardamom, coconut, cream cheese frosting, cream cheese icing, Domestic Godess, Masala Chai, Master Chef, Nigella, Nigella Lawson, Ottolenghi, rose petals. Bookmark the permalink. That is so sweet! Thank you so much. I’ve not been posting as much as I should and your words may have just given me the motivation to get going again! Yummy yummy. I love banana bread and have often thought of putting cream cheese icing on it. This would seem to be the way to do it! 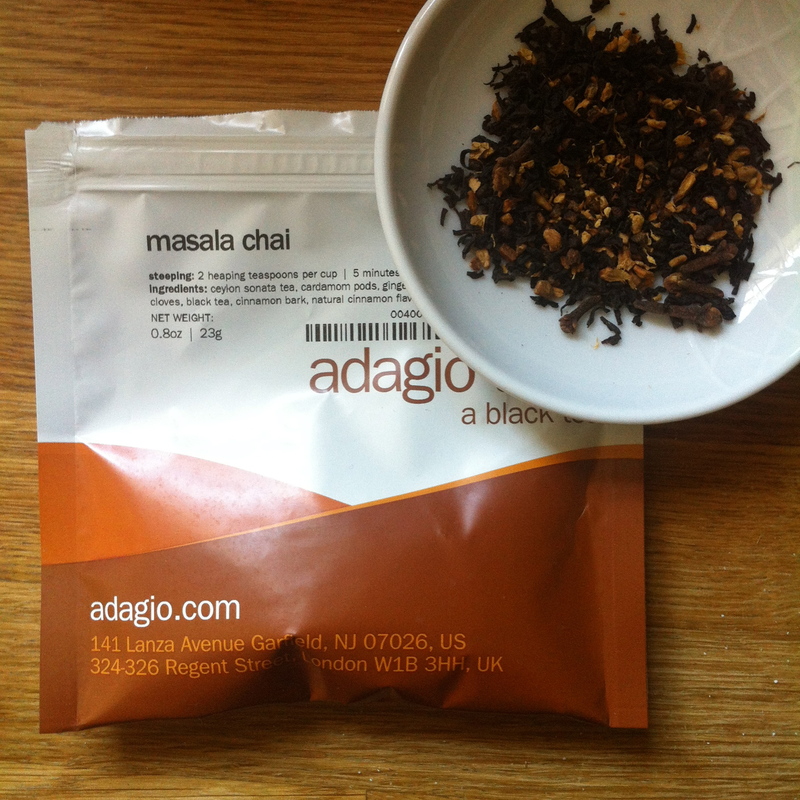 I am going to try and find the masala chai in France (maybe online or local Indian grocers…will see!). Merci! In the meantime, found it on Amazon…yeah! Well done!! You must try it as a drink too – so delicious! Thanks very much. I’ve really missed baking recently so it’s nice to do something special! Thanks June – I do love that chai flavour. Thanks so much for stopping by! 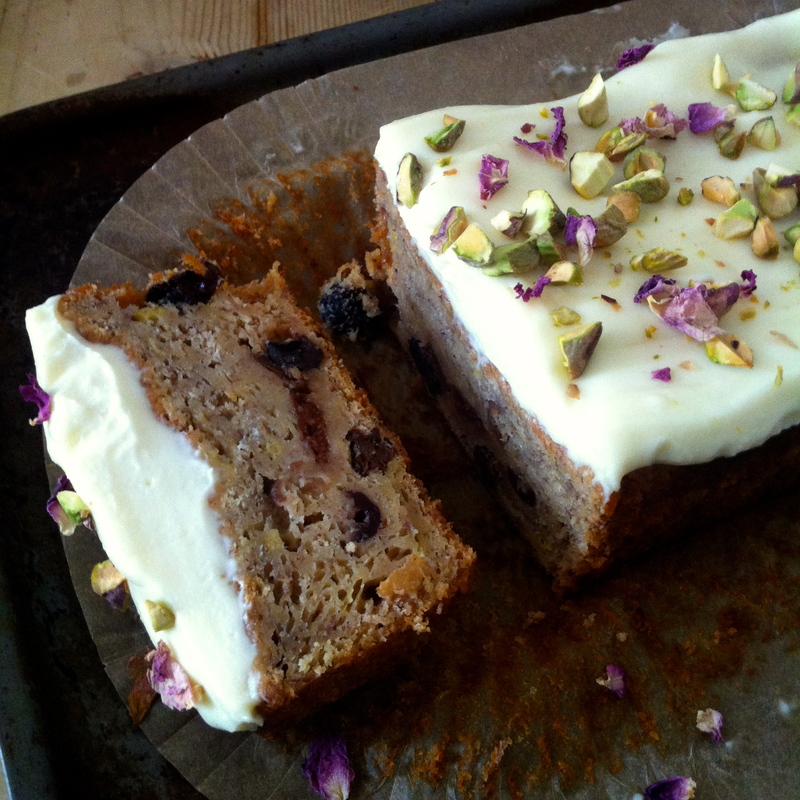 Lovely Selma, These flavours remind me of Indian sweets too and must make this lovely version of a banana cake on my return. Thanks Francesca – hope you are having a wonderful time. Oh yummy! I wonder if they sell Masala Chai in the states… I’ll be on the hunt for some. Thank you for sharing! Adagio are based in the States – if you click on the link which I have embedded in their name, it will take you to a website and from there I am sure you will be able to navigate to the American site. Their range of teas is phenomenal! Thank you and I will try, Selma do you have plans for a cook book? Well, that has got me blushing! I don’t, no though I would love to do one!! Beautiful, and sink or not, it looks like it just made a handy place for the frosting! I have never had a “goto” banana bread that I’ve been completely happy with so I might have to give Nigela’s a try! Very creative! It does make a handy dent for the frosting! 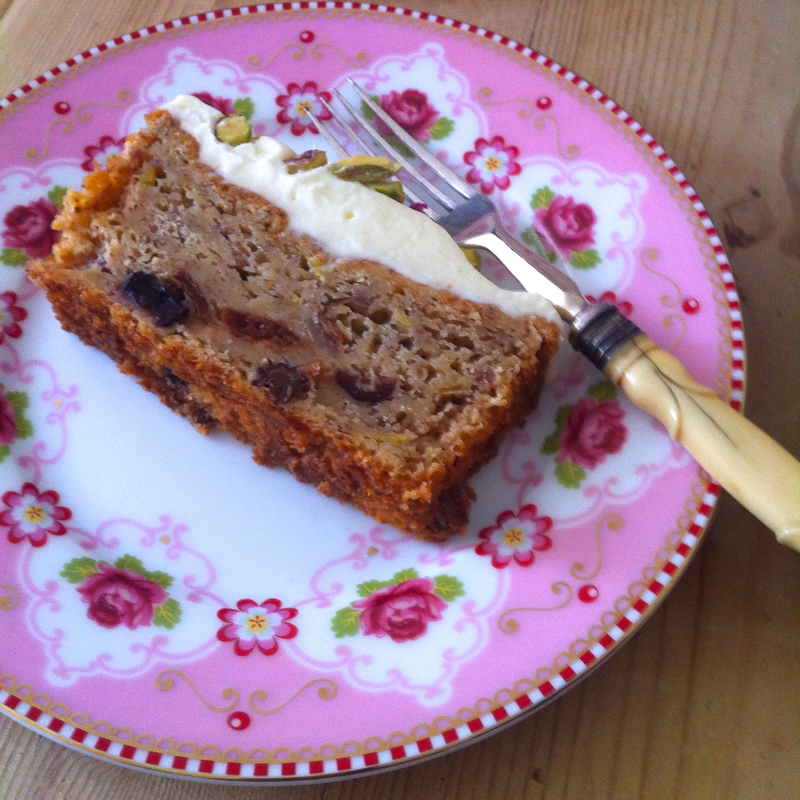 And while I normally swipe off frosting (too sweet and too much) this one is just so moreish… The recipe Banana Bread recipe is a really good one – I’ve been making it for years. 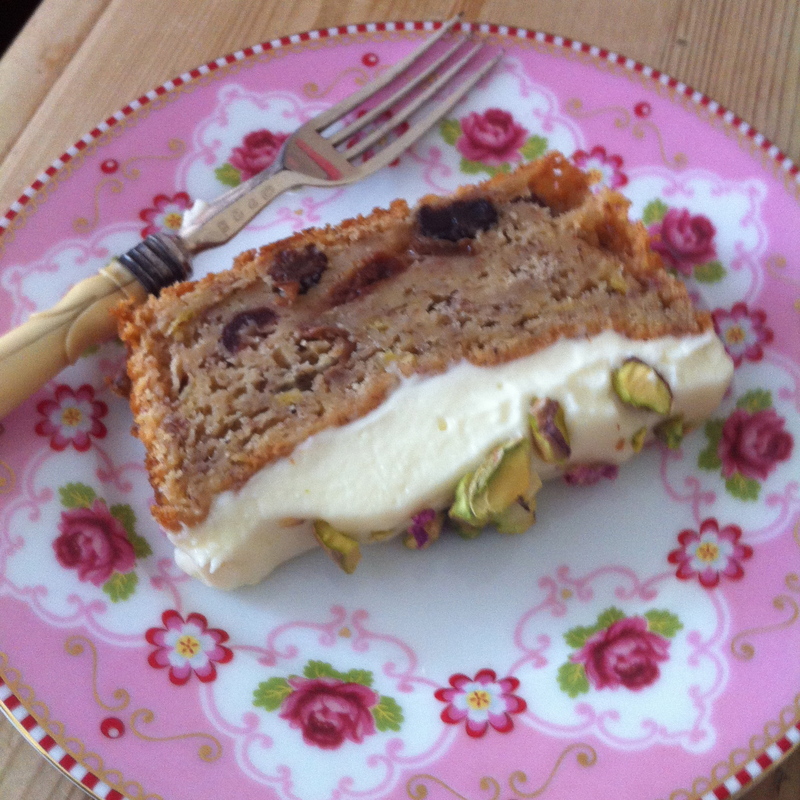 Thanks – the green pistachios and pink petals against the white icing and dark cake really work well. Might start wearing that colour combination!! Oh my, talk about elevating the banana bread. Amazing. Aw, thanks – I didn’t intend to – it just happened! Another great recipe. This I definitely want to try. Thanks for inspiring me! Thanks Cecilia – I am sure you will love the flavours! Well, I am sure that you can still find a teeny little space to squeeze a box into one of those kitchen cupboards!! Now you’re talking! It’s delicious with a cup of tea! Gorgeous Selma, love all the flavors going on. I love the addition of cardamom in the loaf. Wow wonderful looking bread Selma – love each ingredients in there. …. yummmmy yummm…. Thanks Chitra – they work so well with the banana. Oh my this looks so wonderful Selma. Beautiful garnish on top with the dried flowers…what a great idea. As a food stylist you know I am crazy about your fork and plate. The deliciously beautiful bread on the perfect plate with just the right fork! Wow. Love this post. Well, Teresa, you have no idea how much that means to me, coming from you! I’ve had the plate for awhile but needed the right thing on it. 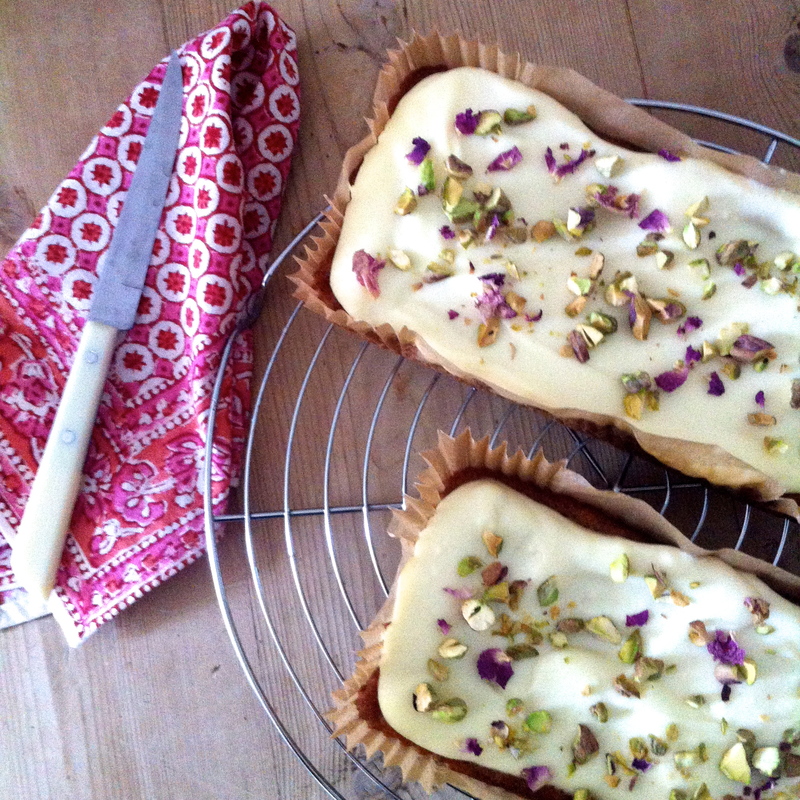 The edible petals have an incredible fragrance which just add to the flavour of the cake. I am sure that you would be able to find some where you are…Thank you for your lovely comment! I loved your creativity with this loaf Selma. Chai spiced banana bread is my favorite kind. Addition of all the dried fruits must have taken it to another level. The frosting!!! Ah!! That’s so gorgeously done. Loved the flavors of coconut and cream cheese with nuts and rose petals. A stunner for sure! Thanks Sonal, I love the freedom of looking in my cupboards and putting flavours together. So glad you like it! 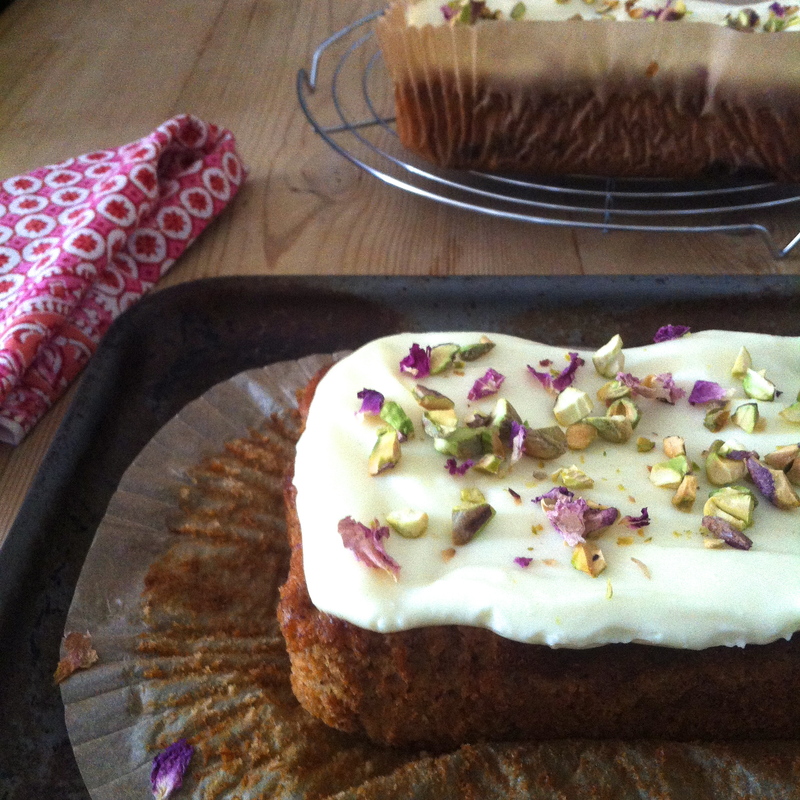 Sounds wonderful Selma – I love chai – and also love the idea of using coconut milk powder in the icing…very clever, I’ll have to remember that one! Thanks so much Indu – the coconut icing is fabulous! Dear Blindieaka … just to let you know that, sadly, Selma passed away last summer … terrible, isn’t it. I didn’t know her in ‘real’ life but we had exchanged the odd email and I was gutted when I found out. Her blog was truly lovely ….